GRAPE VARIETY: 100% Sangiovese marc. PRODUCTION TECHNIQUES: Distillation of the marc from grapes suitable for the production of Brunello di Montalcino with steam current in copper stills. COLOUR: Crystal clear against the light. 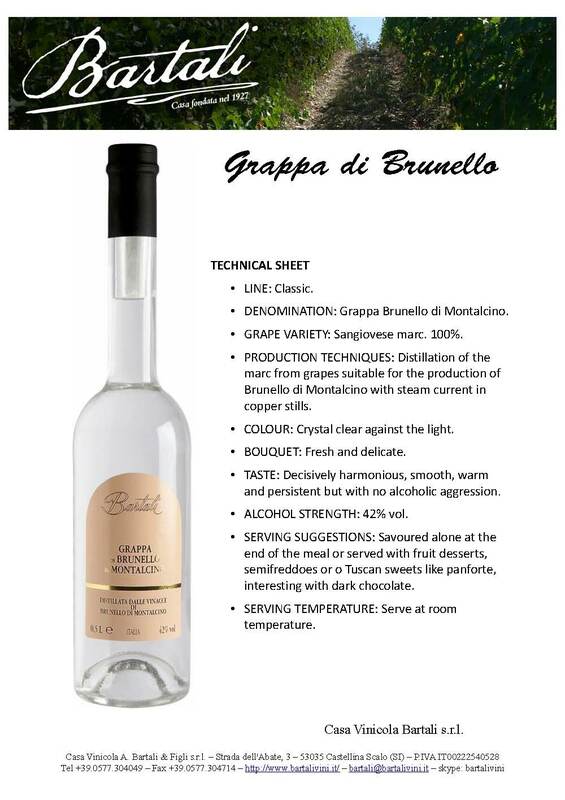 TASTE: Decisively harmonious, smooth, warm and persistent but with no alcoholic aggression. SERVING SUGGESTIONS: Savoured alone at the end of the meal or served with fruit desserts, semifreddoes or o Tuscan sweets like panforte, interesting with dark chocolate. SERVING TEMPERATURE: Serve at room temperature.